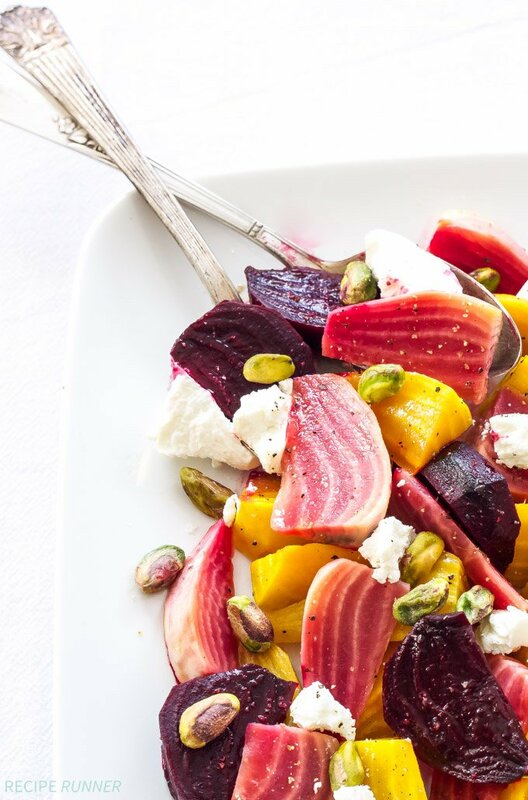 Roasted beets tossed in a white balsamic vinaigrette and simply plated with crumbles of goat cheese and pistachios. This Roasted Balsamic Beet, Goat Cheese and Pistachio Salad is an easy and impressive side dish to add to any meal! To say we got some snow on Wednesday would be an understatement. The news totally undershot the amount and intensity of the spring snow that (literally) blew through Colorado. If you follow me on Instagram I posted a couple pictures from the 2016 snowmageddon, it was a doozy! Here in Highlands Ranch we ended up with about 17 inches of snow, although it felt like 30 inches as I spent the majority of the afternoon shoveling the walkway, driveway and sidewalks in front of our house. The snow was heavy and wet…no need to hit the gym and lift weights just shovel snow! I wasn’t alone as I dug my way out, half the people on the street were out also trying to shovel their way out from this blizzard. Cars were getting stuck in the streets and neighbors would go over and help push to get them out, it was kind of neat to see everyone come together and help each other. That’s the thing with spring in Colorado, you never know what you’re going to get. Shorts and t-shirt one day, snow boots and heavy coat the next. It definitely keeps me on my toes! We’re supposed to get another snow storm tonight and tomorrow morning, nothing like the one on Wednesday…or so they say. Fingers crossed it won’t be as bad and that I can make my way to the store to get everything I need to make Easter dinner. One dish that will be on our table this year is this Roasted Balsamic Beet, Goat Cheese and Pistachio Salad. The last time I made a beet salad you guys really seemed to like it, so I decided I had to make another one. I’ve gone completely beet crazy! When I made the salad I ate the whole thing in two days. My husband won’t touch beets, which I don’t understand. Sure they taste earthy when they’re raw, but roasted they are so sweet! 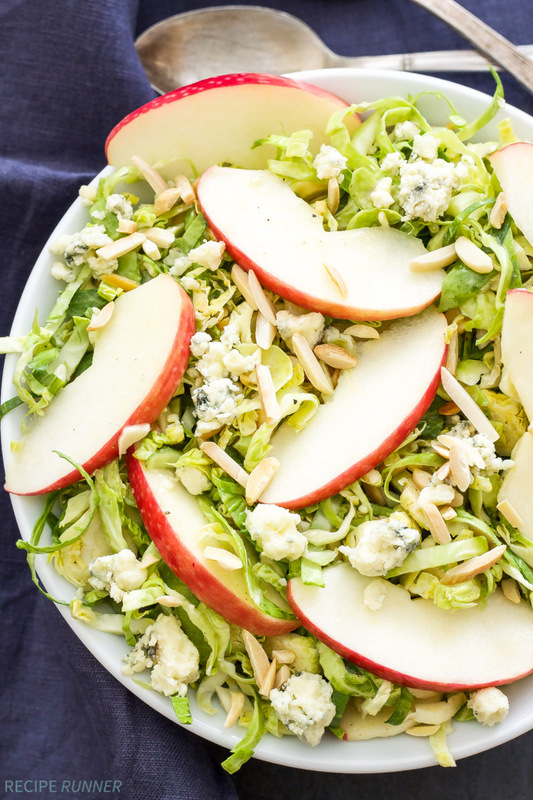 This salad is easy to make and I love the colors in it, so perfect for spring. 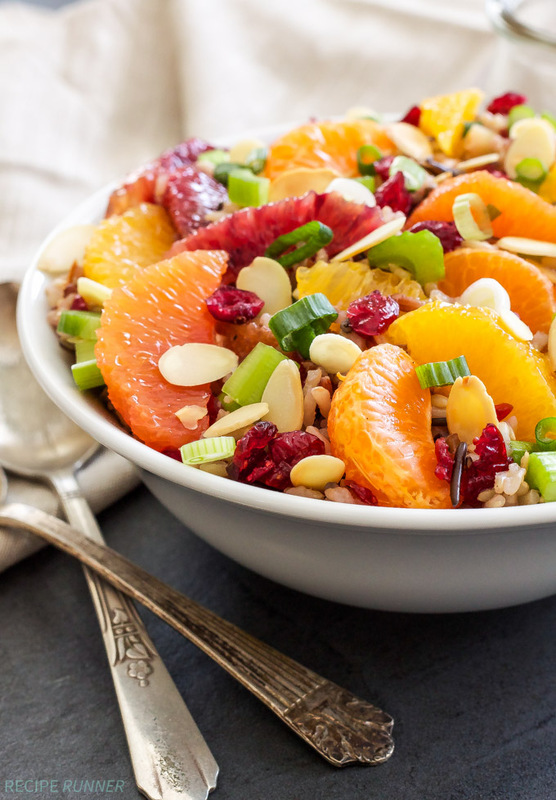 The hardest part of this salad is peeling the beets and trying not to stain your fingers, of course you can avoid that by using just the golden and chioggia (striped) variety. 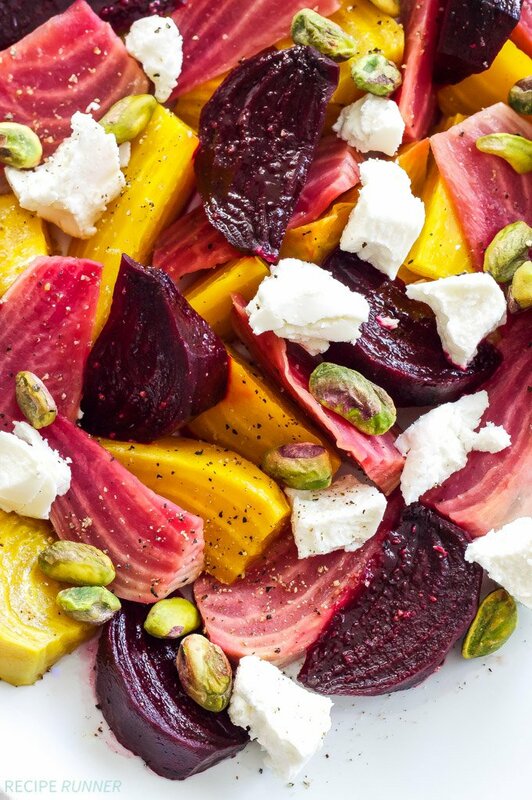 Once the beets are roasted they’re tossed in a simple white balsamic vinaigrette (toss the red ones separately to avoid turning them all pink) and plated with goat cheese crumbles, pistachios and a sprinkling of kosher salt and freshly ground black pepper. This Roasted Balsamic Beet, Goat Cheese and Pistachio Salad is an easy and impressive side dish to add to any meal! Peel the beets with a vegetable peeler and cut them into wedges. 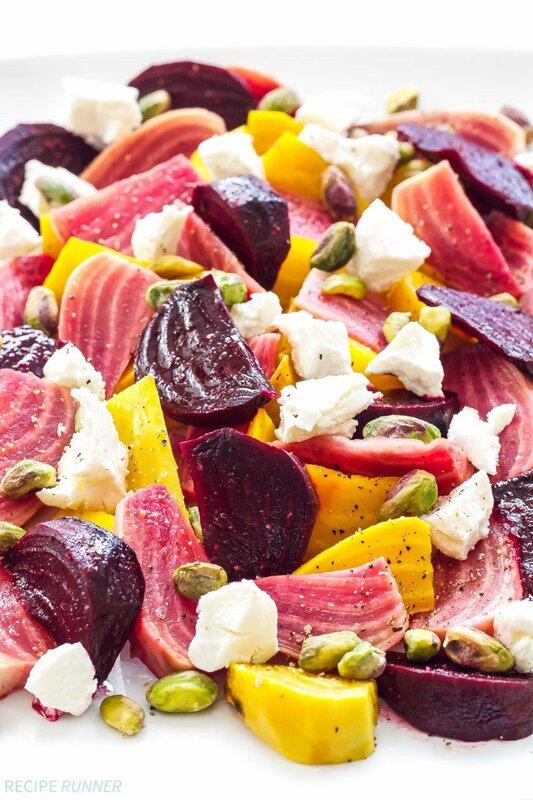 Place the beets on the prepared baking sheet, drizzle them with olive oil, salt and pepper and toss to coat them. If you are using a variety of different beets keep them separated so they don't bleed onto each other. Spread the beets into a single layer then roast them for approximately 25-30 minutes minutes or until tender, shaking the tray and tossing them around a couple of time to ensure even cooking. Remove from the oven and let cool while you make the vinaigrette. Whisk together all of the ingredients for the vinaigrette in a medium sized bowl. Place the beets in the vinaigrette and toss until coated. If you are using a variety of beets start with the lightest colored ones first or divide the vinaigrette into separate bowls as the beet juices will dye the vinaigrette. 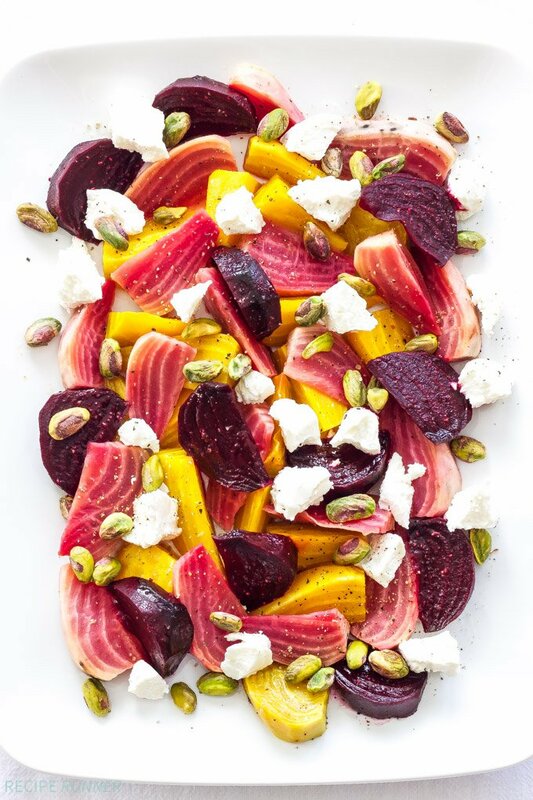 Arrange the beets onto a serving platter or in a bowl and top with crumbled goat cheese, pistachios, kosher salt and freshly ground black pepper. 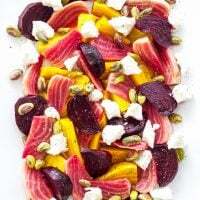 If you plan to make the salad ahead of time, marinate the beets in separate bowls with the vinaigrette and assemble the salad just before serving to ensure that the pistachios stay crunchy and the beet juices don't bleed onto each other or the goat cheese. This sounds so great. I love goats cheese in combination with balsamic vinegar! By the way, I love the food styling. Such pretty cutlery you have. Thanks Vivian! Goat cheese is one of my favorites to add to just about anything! 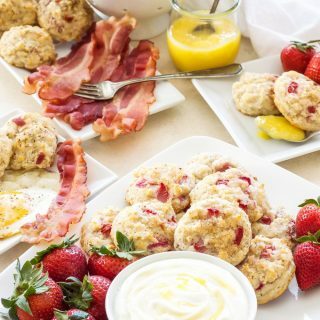 This dish is beautiful, I can't wait to make it for my next backyard party! Beets and goat cheese are made to go together. So good! 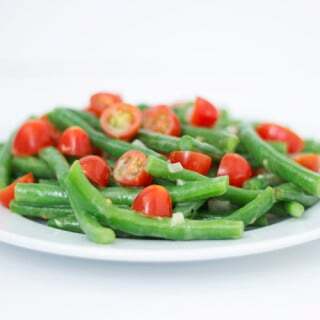 Beautiful salad! They really are! Thanks Allison! 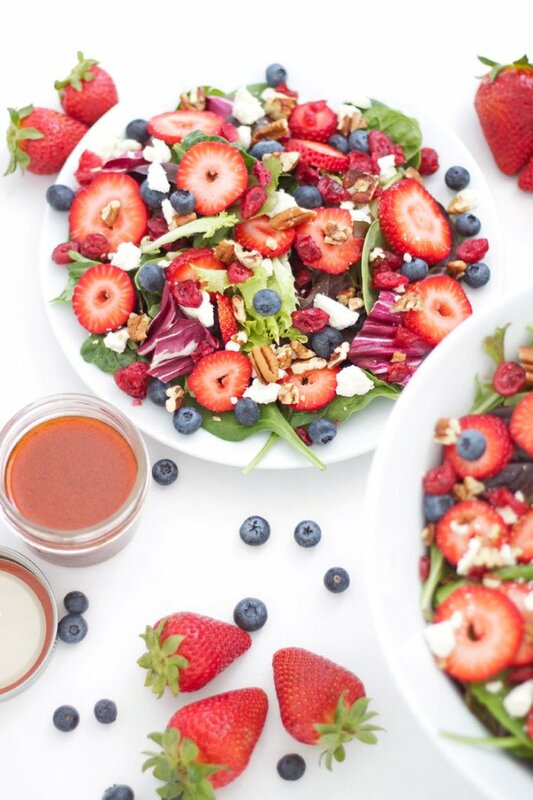 What a gorgeous salad! My husband is a huge fan of roasted beets, so I know this salad would be a hit at our house! Goat cheese is my favorite! 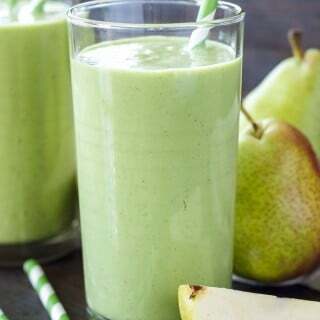 Going to have to try this!